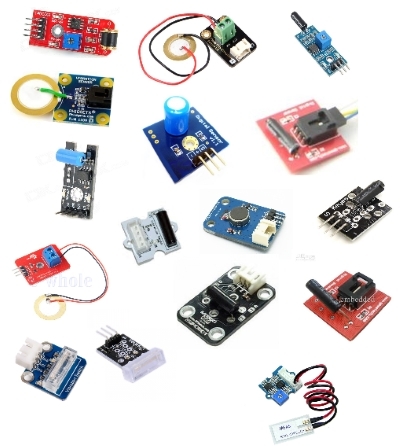 We will learn how to connect vibration sensor module, LEDs and SD card module to Arduino board and log vibration data on SD card. Many Applications can created by measuring Vibration level, but sensing vibration accurately is a difficult job. The vibration sensor module is based on vibration switch component which can detect the weak vibration signals. The sensor can work for vibration-related modules. A vibration switch is a device that recognizes the amplitude of the vibration to which it is exposed and provides some sort of response when this amplitude exceeds a predetermined threshold value. The switch response is typically an electrical contact closure or contact opening. The electrical contact may be either an electromechanical relay or solid-state triac. The main principle of vibration switch is that, conductive vibration spring and trigger pin are precisely placed in switch ontology and bond to curing position through adhesive. Normally, the spring and the trigger pin do not contact. Once shook, the spring will shake and contact with trigger pin to conduct and generate trigger signals. Let's check different types (analog and digital) vibration sensor modules. It can be also a modules with both signals (analog and digital). 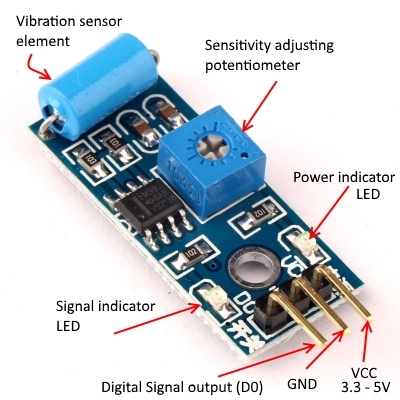 The vibration sensor SW-420 Comes with breakout board that includes comparator LM 393 and Adjustable on board potentiometer for sensitivity threshold selection, and signal indication LED. This sensor module produce logic states depends on vibration and external force applied on it. When there is no vibration this module gives logic LOW output. When it feels vibration then output of this module goes to logic HIGH. The working bias of this circuit is between 3.3V to 5V DC. Its omnidirectional in nature meaning any angle can trigger the sensor. The Piezo Vibration Sensor is based on piezoelectric transducer. It is well known that piezoelectric materials responds to strain (deflection) changes or applied force by generating a measurable output voltage. This output voltage is proportional to the strength of shock or vibration. So you can measure and characterize the vibration. 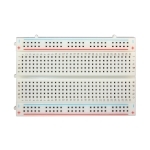 VCC (5V or +) - connect to 5V pin of Arduino board. A0 (or Aout) - Analog output to Arduino board. 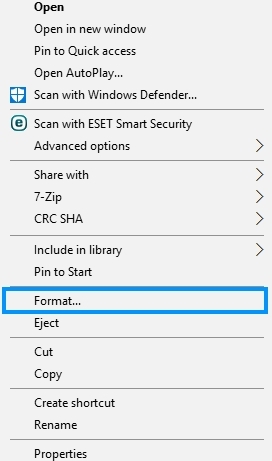 Connect to analog Arduino pin. 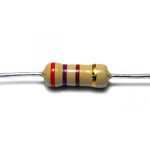 The "A0", is a serial signal 0-5 volts that when no vibration it outputs 0 volts, when level of vibration very high, 5 volts. The "D0", is configured with the trim pot and is brought high when the vibration level reaches a desired point. 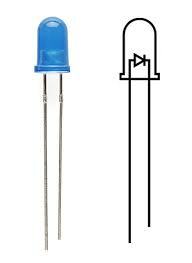 Connect the long leg of the LED (the positive leg, called the anode) to the other end of the resistor. Connect the short leg of the LED (the negative leg, called the cathode) to the GND. Resistor connected for long leg. CS -> 4 This can be the hardware SS pin - pin 10 (on most Arduino boards) or pin 53 (on the Mega) - or another pin specified in the call to SD.begin(). 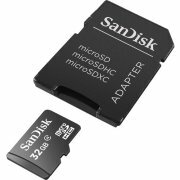 Note that even if you don't use the hardware SS pin, it must be left as an output or the SD library won't work. 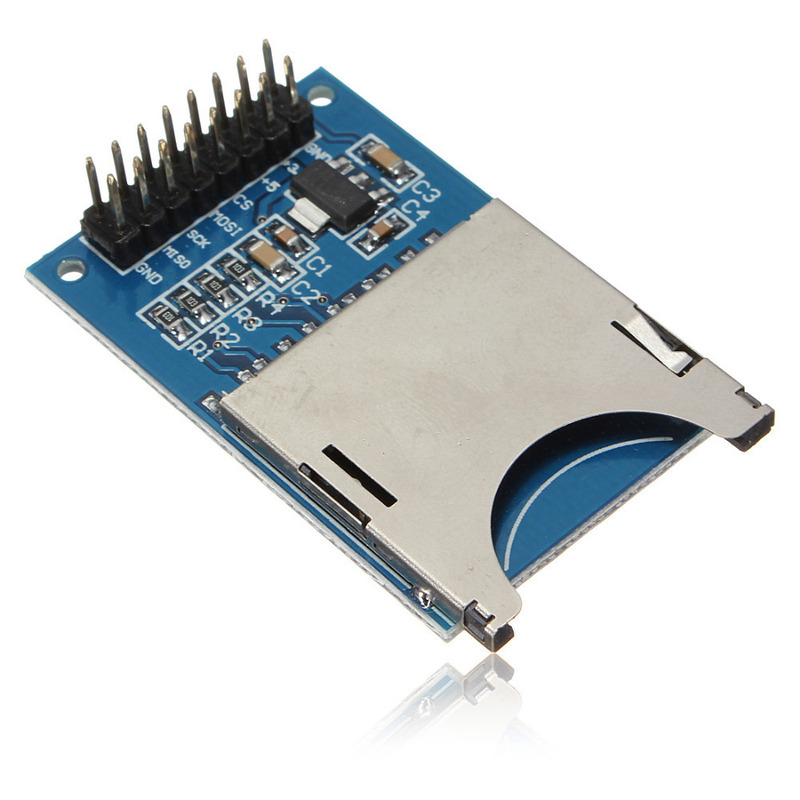 Different boards use different pins for this functionality, so be sure you’ve selected the correct pin in SD.begin(). 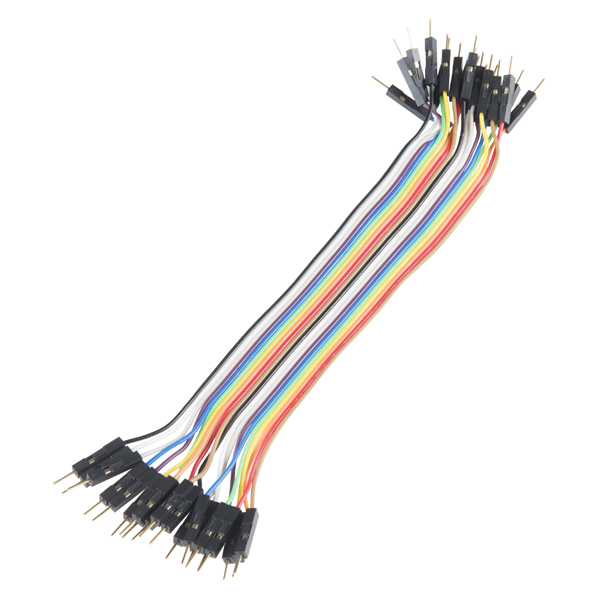 Note: different Arduino boards have different SPI pins. 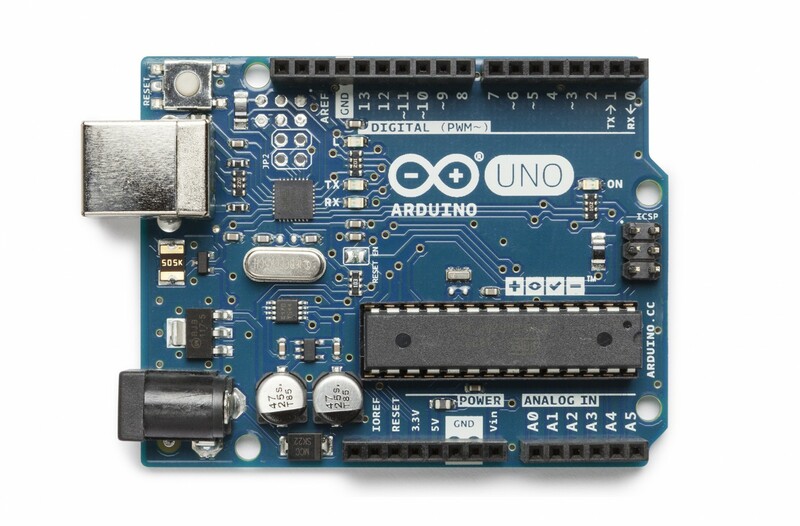 If you’re using another Arduino board, check the Arduino SPI documentation. The output can be a digital signal (D0) LOW or HIGH, depending on the amount of water on the surface. If the amount of water exceeds a certain predefined threshold value, the modules outputs LOW, otherwise it outputs HIGH. The threshold value for the digital signal can be adjusted using the potentiometer. 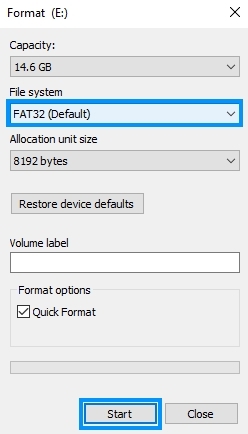 The output can be a analog signal and so you’ll get a value between 0 and 1023. Please note that the analog value returned will vary depending on what voltage is provided for the sensor. 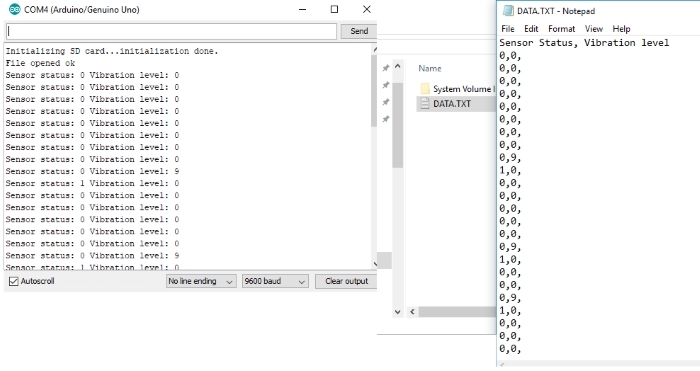 In this code we create a loggingVibration() function function that we call in the loop() to log the moisture to the DATA.txt file in the SD card. 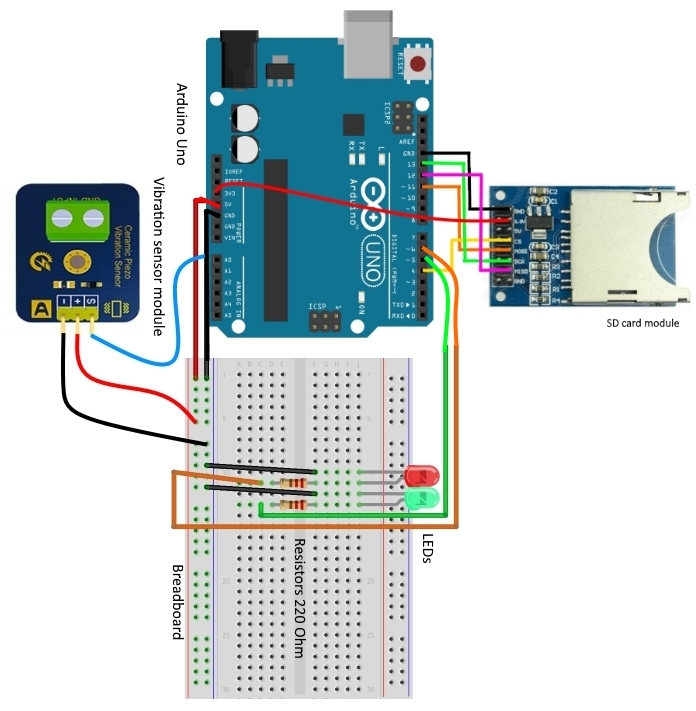 Connect the SD card module and vibration sensor module to the Arduino Uno board. When no vibration is detected, Vibration sensor output is 0 (low voltage),otherwise its output is 1(high voltage). If Arduino get 0 (no vibration) from vibration sensor it will turn on green LED and turn off Red LED. 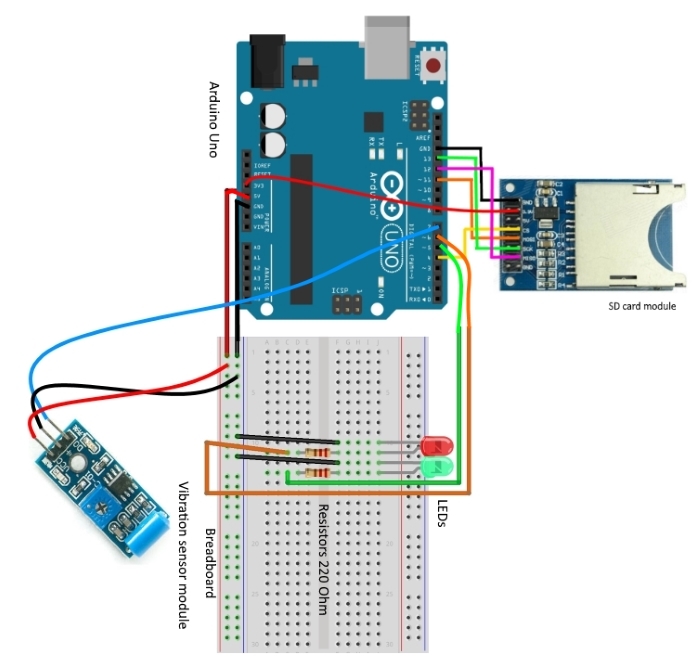 If Arduino get 1 from vibration sensor, it will turn on Red LED and turn off green LED. When the vibration level will be more then 100 (set threshold), it will turn on Red LED and turn off green LED. 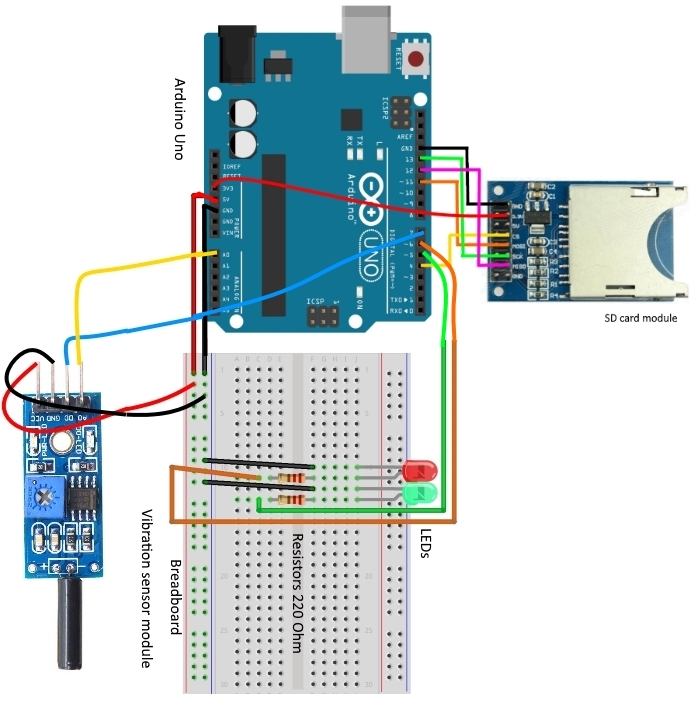 We have learnt how to connect vibration sensor module, LEDs and SD card module to Arduino board and log vibration data on SD card.